StoneFly OptiSANTMmeets the challenges of the most demanding computing environments while setting the standard for ease of use. OptiSAN is a perfect complement to a Fibre Channel SAN while providing all the benefits of an IP SAN. It supports high transactional rates and sustains optimum throughput for high bandwidth functions making it a versatile workhorse for demanding applications. Based on a Storage Concentrator® i3000 running the StoneFusion® 4.0 OS, OptiSAN delivers key functions users have come to expect in an IP SAN, including centralized management, storage consolidation, access control, storage provisioning, and volume management. It even includes advanced storage management functions, such as synchronous mirroring through built-in StoneFly ReflectionTM and StoneFly Snapshot at no extra charge. OptiSAN storage arrays come with an abundance of high-reliability features, including advanced sub-array support with true RAID data protection built into 14 Serial ATA II high-speed disk drives. 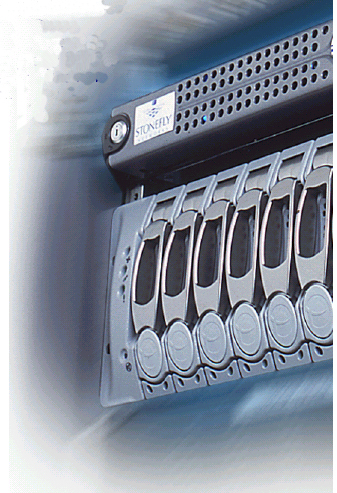 Dual Fibre Channel connectors on each RAID controller enable FailOver clustering for high availability. To provide enterprise-level performance, StoneFly also offers a wide range of software and hardware options, such as Continuous Data Protection, D2D Backup and FailOver. 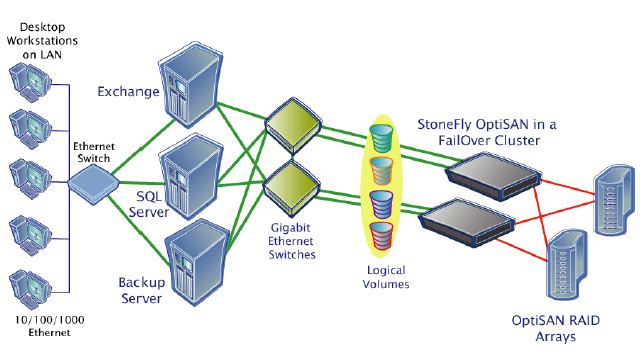 The StoneFly OptiSAN line brings unprecedented performance and high availability to your IP SAN. OptiSAN Fibre Channel arrays can be connected directly to a Storage Concentrator or connect through a Fibre Channel switch. The Storage Concentrators can also serve up storage on a Fibre Channel SAN to servers on the gigabit Ethernet network. StoneFly Networks not responsible for misprints, typographical errors or omissions. StoneFly OptiSAN nodes start with one array populated with fourteen drives. Expand arrays one at a time or add multiple arrays to scale capacity easily and quickly. With advanced software features, OptiSANs can provide performance tailored to your applications now and in the future.